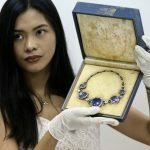 MANILA, Philippines – Philippine authorities are staging an online exhibition of jewelry owned by late dictator Ferdinand Marcos and his family to try to educate a new generation about the corruption of that era. The postings on Facebook and Twitter by the Presidential Commission on Good Government (PCGG) come as the family tries to extend its political comeback in elections in May. “The PCGG will be posting selected jewelry items to show and remind the present generation of the excesses and extravagance of the Marcoses in their two-decade dictatorship,” the anti-corruption agency said on its website. “The Virtual Jewelry Exhibit” began in mid-March with regular postings showcasing valuables recovered after the dictator was ousted by a military-backed popular uprising in 1986. Aside from pictures of the jewels uploaded regularly, there are postings explaining what they cost the country. 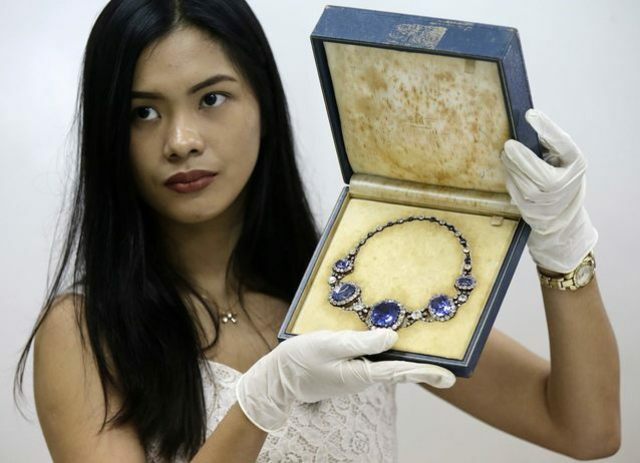 The PCGG, which plans eventually to auction off the Marcos jewels, has previously said that international auction houses have appraised their total value at more than a billion pesos ($21 million). Marcos and his jet-setting wife Imelda were accused of massively enriching themselves during their years in power while the country sank deeper into poverty. Imelda was known for her extravagance, amassing jewelry, art masterpieces and a huge collection of shoes. Although the family fled abroad during the 1986 revolt, they were allowed to return home after the former dictator died in exile in 1989. Since then the Marcoses have made a startling resurgence, with members not only evading criminal charges but winning elections to prominent positions. Ferdinand Marcos Jr., previously elected to the powerful Senate, is now running for vice-president. Widow Imelda Marcos is seeking re-election to Congress and her eldest daughter Imee is running for another term as governor of the family bailiwick in the north. Despite a campaign by victims of the Marcos regime against his candidacy, surveys show Marcos Jr. is second in the race for the vice-presidency. Imelda Marcos has previously said she hopes her son will eventually become president. Critics say the generation that grew up after the Marcos years has no memory of the abuses, setting the stage for the family’s return to power.